Every hairdresser needs to possess good social and hand work skills. However, to have a prospering business, you also need to have some basic notions of the marketing tools to promote your salon. Starting with social networks and TV advertisements is a good idea, but may not be a sufficient one, as it doesn’t apply to the customers who you can meet in a real-life conversation. Of course, you can always show some pictures of your works on your smartphone and give your mobile number, but this way you’ll lose your time (and it is precious as you know) and take too much time of your potential client. 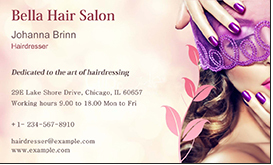 If you want to speed up the process of demonstration and establishing the contact, hair salon business cards is the right solution. Modern software allows adding photos to a business card. So you can make a little portfolio that will stay with the customer and inspire him or her to give you a call. All your contact data will be right there – no need to turn your handbag inside out looking for a pen or mobile. You can include a screenshot of the map right into the card design on its rear side to show where your salon is located. It will help your customers arrive in time and with no complaints of parking problems. Using special user-friendly card making software like Business Card Maker you can make not only cards for your salon and for each of your employees. The program offers 550+ design templates that can be easily edited and customized. 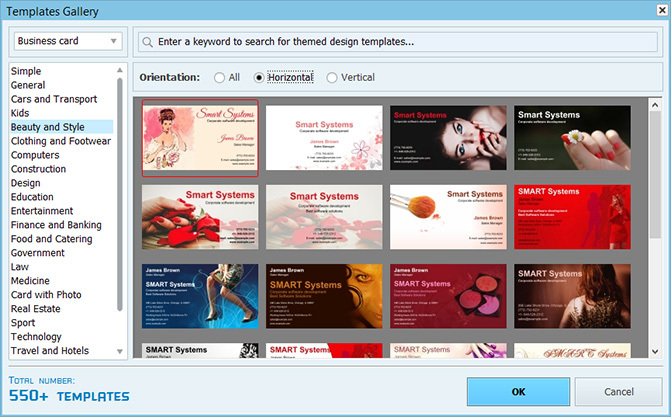 You just need to install the program and go to the Beauty and Style category in the list of the Design Templates. 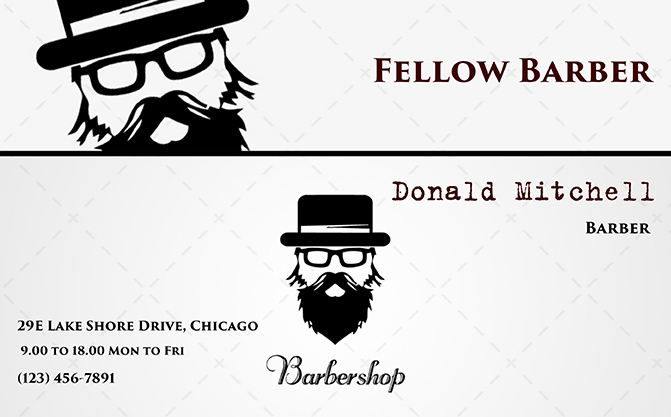 Choose among hair salon business cards with horizontal or vertical orientation, click on the preview icon and then enter your data. The tips below will help you to find a perfect style for your card design. Enjoy! If you are an owner of a small beauty making company, then you certainly have many different services to offer to the world. 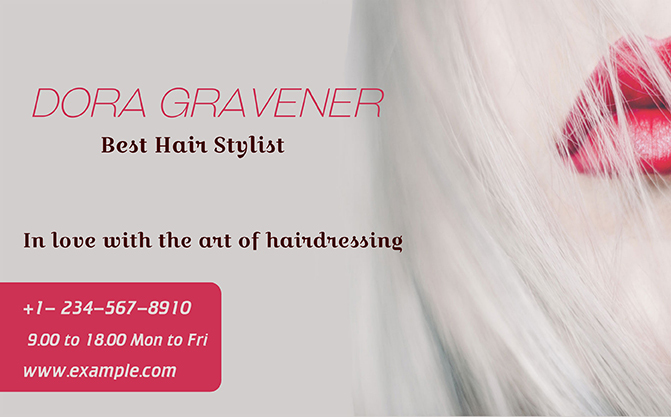 Hair salon business cards for the one like you should comprise all types of work you deal with. Making a collage of photos is a good idea to do that. Overlay it with a semi-transparent shape to tame the contrasting colors of different shots and make the card design look harmonious and complete. Want something chic and fashionable? With Business Card Maker there is plenty of options to create a stunning design like that. The software can create a reverse side that you can fill with any necessary information or just use the same background as for the front side. Remember that the font and background colors should match each other, and that smooth and matte tones appeal to the eye more that bright and vivid ones. This style deals with more male embellishments – scissors, clippers, razors, combs, brushes and neck dusters. Keep the colors in the cold palette like grey, blue or white. It helps to create a reserved, classic look. The software allows you to use your own picture for the background, so there is no problem for having the necessary imagery in your design. Tender pastel colors and floral ornaments are the best decorations for your design if your professional field is wedding hairstyles or makeup. Personalize the card template with your salon name, address, working hours, website address and telephone numbers. Play with the fonts of your design – italic ones look perfect with floral decorations and light colored backgrounds. 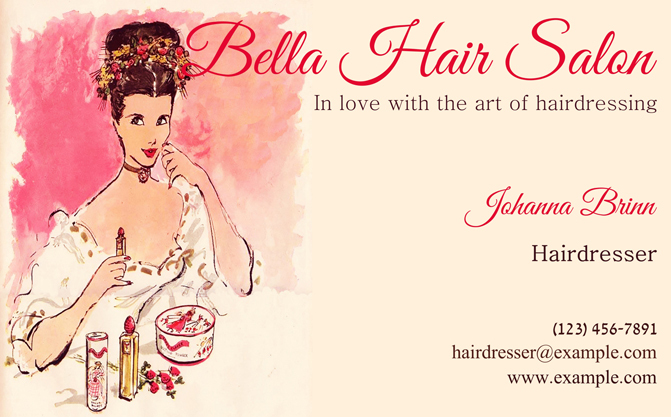 Hair salon business cards are a perfect means to attract attention and to establish credibility. Using Business Card Maker the design process becomes as easy as one can have ever imagined. The program has an intuitive interface with a smart print module that produces high quality cards only. Thoughtful design really makes a difference, and you can make sure of that by charming your first card recipients. 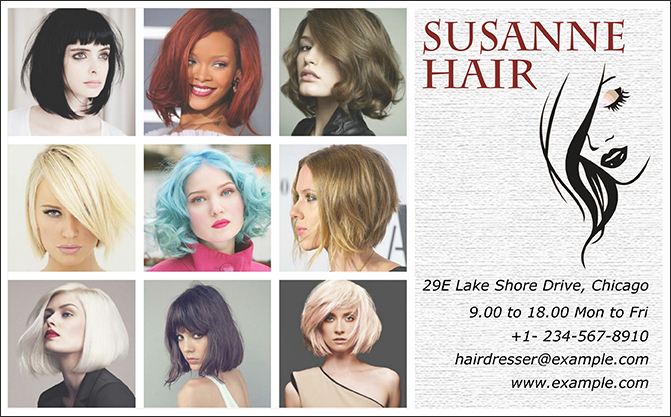 The goal of any hair styling business is to make beauty uncover itself and shine in new splendor. With a proper card design you can assure your potential customer that you are the best in that business. Just download the software, make your first card and see it for yourself!